... eggs, sausage, toast, and hash browns.Not sure some of these folks travel the USA and sample what is out there: ser...Great breakfast! I went here for breakfast - 3 days in a row! Good food, reasonable prices, and friendly service. Roy's sausage is a must-have! The food was plentiful and tasty. The service was relaxed and homey. The building is rustic and may not be appealing t to some people. But what is the fun if you can't enjoy a little adventure!? Order the special sausage ( Roy's), so tasty! One of my favorite breakfast places, I am so glad it re opened. The coffee is even good. Large portions and crispy homemade hashbrowns, extra large eggs. We ordered the half chef salad, which turned out to be big enough for 2 and the chimichanga. Both were very good. But having fun with good wait staff is half the pleasure of eating out - and we had fun here. 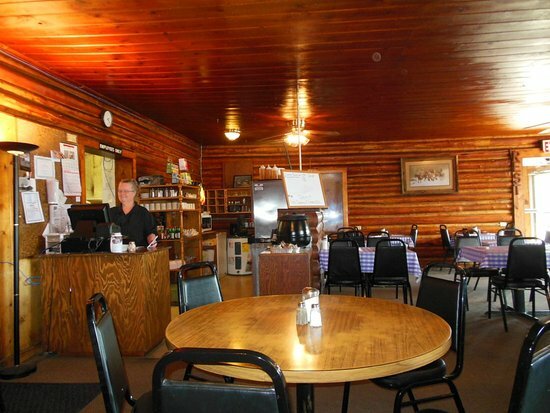 For a Great Meal, Don't Miss the Y Inn! My wife and I had breakfast here, and the food and service were great. We each had the basic bacon and eggs, but I paid extra for the special sausage, which was worth it. We would stop here again! Did I mention the food? I had a simple burger with sweet potato fries and everything was perfectly prepared. Would I return? You Bet! Place was very busy at lunch time on a Sunday but the service was still good. Get quick answers from Y-Inn Cafe staff and past visitors.